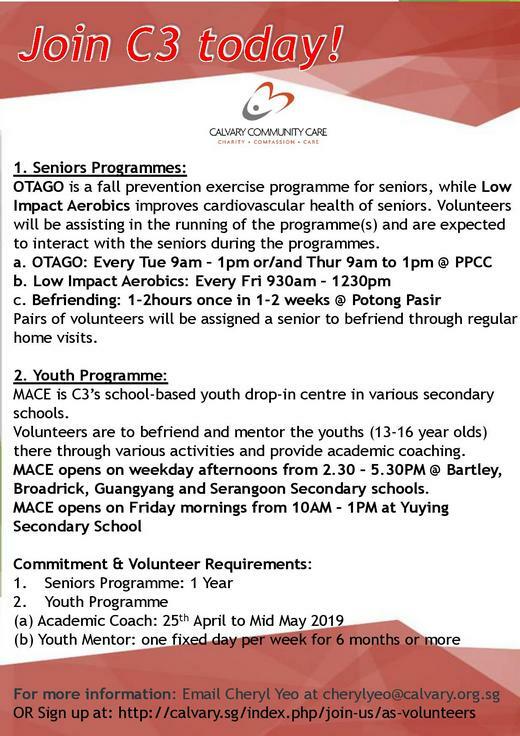 OTAGO is a fall prevention exercise programme for seniors, Rummikub is a boardgame that helps seniors in their mental wellness & Low Impact Aerobics improves cardiovascular health of seniors. Volunteers will be assisting in the running of the programme(s) and are expected to interact with the seniors during the programmes. Pairs of volunteers will be assigned a senior to befriend through regular home visits. 2. C3 Children Programmes: GROW & StoryL.A.B. GROW (Gain Reading, Oral & Writing skills) was developed by C3 specifically to address the literacy needs of children from low-income/non-English speaking families who struggle with reading proficiency. Story L.A.B. (Literacy Awareness Builders) brings the experience of “bedtime stories” for these children, where volunteers read stories to a small group of children. Community based youth drop-in centre at Potong Pasir Community Club. Volunteers are to conduct activities for the youths (13-16 year olds) there, befriend them and provide academic coaching. Calvary Community Care needs you!